“The Great Recession: Market Failure or Government Failure?” BUY IT NOW! Robert Hetzel’s new book “The Great Recession: Market Failure or Government Failure?” is now available for pre-order at Amazon.com (and Amazon.co.uk). Did you order it!? Needless to say I have ordered my version and hope it will arrive in my mailbox sometime around my birthday in early March! I am very much looking forward to reading this book that I am pretty sure will have a very significant impact on the understanding of the causes of the Great Recession among economists and is likely to become a piece that economic historians will study in the future. In my recent post on “boom, bust and bubbles” I tried to sketch a monetary theory of bubbles. In this post I try to give an overview of what in my view seems to be the normal chain of events in boom-bust and in the formation of bubbles. This is not a theory, but rather what I consider to be some empirical regularities in the formation and bursting of bubbles – and the common policy mistakes made by central banks and governments. – Third policy mistake: Policy makers realise that they made a mistake and now try to undo it “in hindsight” not realising that the setting has changed. Monetary conditions has already been tightened. – Real GDP growth remains lackluster despite the initial financial distress easing. This is NOT due to an unavoidable deleveraging, but is a result of too tight monetary policy, but also because the positive supply shock that sat the entire process in motion has eased off. Recently it has gotten quite a bit of attention that some investors believe that there is a bubble in the Chinese property market and we will be heading for a bust soon and the fact that I recently visited Dubai have made me think of how to explain bubbles and if there is such a thing as bubbles in the first bubbles. I must say I have some experience with bubbles. In 2006 I co-authoured a paper on the Icelandic economy where we forecasted a bust of the Icelandic bubble – I don’t think we called it a bubble, but it was pretty clear that that is what we meant it was. And in 2007 I co-authored a number of papers calling a bust to the bubbles in certain Central and Eastern European economies – most notably the Baltic economies. While I am proud to have gotten it right – both Iceland and the Baltic States went through major economic and financial crisis – I nonetheless still feel that I am not entire sure why I got it right. I am the first to admit that there certainly quite a bit of luck involved (never underestimate the importance of luck). Things could easily have gone much different. However, I do not doubt that the fact that monetary conditions were excessive loose played a key role both in the case of Iceland and in the Baltic States. I have since come to realise that moral hazard among investors undoubtedly played a key role in these bubbles. But most of all my conclusion is that the formation of bubbles is a complicated process where a number of factors play together to lead to bubbles. At the core of these “accidents”, however, is a chain of monetary policy mistakes. What is bubbles? And do they really exist? If one follows the financial media one would nearly on a daily basis hear about “bubbles” in that and that market. Hence, financial journalists clearly have a tendency to see bubbles everywhere – and so do some economists especially those of us who work in the financial sector where “airtime” is important. However, the fact is that what really could be considered as bubbles are quite rare. The fact that all the bubble-thinkers can mention the South Sea bubble or the Dutch Tulip bubble of 1637 that happened hundreds years ago is a pretty good illustration of this. If bubbles really were this common then we would have hundreds of cases to study. We don’t have that. That to me this indicates that bubbles do not form easily – they are rare and form as a consequence of a complicated process of random events that play together in a complicated unpredictable process. I think in general that it is wrong to see any increase in assets prices that is later corrected as a bubble. Obviously investors make mistakes. We after all live in an uncertain world. Mistakes are not bubbles. We can only talk about bubbles if most investors make the same mistakes at the same time. Economists do not have a commonly accepted description of what a bubble is and this is probably again because bubbles are so relatively rare. But let me try to give a definitions. I my view bubbles are significant economic wide misallocation of labour and capital that last for a certain period and then is followed by an unwinding of this misallocation (we could also call this boom-bust). In that sense communist Soviet Union was a major bubble. That also illustrates that distortion of relative prices is at the centre of the description and formation of bubbles. Below I will try to sketch a monetary based theory of bubbles – and here the word sketch is important because I am not actually sure that there really can be formulated a theory of bubbles as they are “outliers” rather than the norm in free market economies. In my view the starting point for the formation of bubbles actually is that something good happens. Most examples of “bubbles” (or quasi-bubbles) we can find with economic wide impact have been in Emerging Markets. A good example is the boom in the South East Asian economies in the early 1990s or the boom in Southern Europe and Central and Eastern European during the 2000s. All these economies saw significant structural reforms combined with some kind of monetary stabilisation, but also later on boom-bust. Take for example Latvia that became independent in 1991 after the collapse of the Soviet Union. After independence Latvia underwent serious structural reforms and the transformation from planned economy to a free market economy happened relatively fast. This lead to a massively positive supply shock. Furthermore, a quasi-currency board was implemented early on. The positive supply shock (which played out over years) and the monetary stabilisation through the currency board regime brought inflation down and (initially) under control. So the starting point for what later became a massive misallocation of resources started out with a lot of good things happening. As the stabilisation and reform phase plays out the initial problems start to emerge. 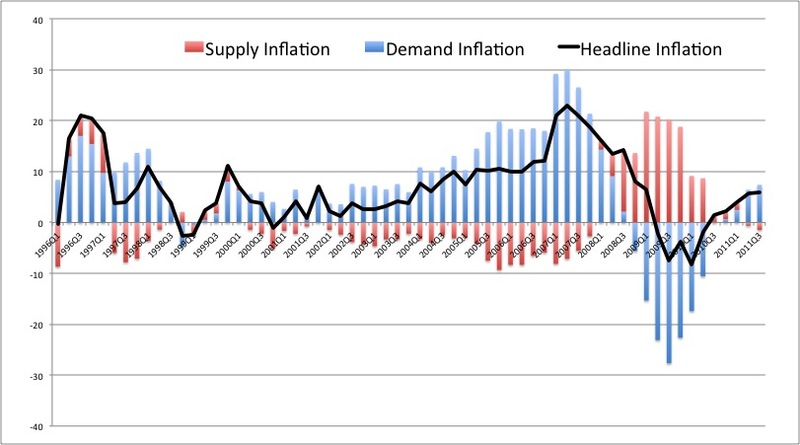 The problem is that the monetary policies that initially were stabilising soon becomes destabilising and here the distinction between “demand inflation” and “supply inflation” is key (See my discussion decomposion demand and supply inflation here). Often countries in Emerging Markets with underdeveloped financial markets will choose to fix their currency to more stable country’s currency – for example the US dollar or in the old days the D-mark – but a policy of inflation targeting has also in recent years been popular. These policies often succeed in bringing nominal stability to begin with, but because the central bank directly or indirectly target headline inflation monetary policy is eased when positive supply shocks help curb inflationary pressures. What emerges is what Austrian economists has termed “relative inflation” – while headline inflation remains “under control” demand inflation (the inflation created by monetary policy) increases while supply inflation drops or even turn into supply deflation. This is a consequence of either a fixed exchange rate policy or an inflation targeting policy where headline inflation rather than demand inflation is targeted. My view on relative inflation has to a very large extent been influenced by George Selgin’s work – see for example George’s excellent little book “Less than zero” for a discussion of relative inflation. I think, however, that I am slightly less concerned about the dangers of relative inflation than Selgin is and I would probably stress that relative inflation alone can not explain bubbles. It is a key ingredient in the formation of bubbles, but rarely the only ingredient. Some – George Selgin for example (see here) – would argue that there was a significant rise in relatively inflation in the US prior to 2008. I am somewhat skeptical about this as I can not find it in my own decompostion of the inflation data and NGDP did not really increase above it’s 5-5.5% trend in the period just prior to 2008. However, a better candidate for rising relative inflation having played a role in the formation of a bubble in my view is the IT-bubble in the late 1990s that finally bursted in 2001, but I am even skeptical about this. For a good discussion of this see David Beckworth innovative Ph.D. dissertation from 2003. There are, however, much more obvious candidates. While the I do not necessarily think US monetary policy was excessively loose in terms of the US economy it might have been too loose for everybody else and the dollar’s role as a international reserve currency might very well have exported loose monetary policy to other countries. That probably – combined with policy mistakes in Europe and easy Chinese monetary policy – lead to excessive loose monetary conditions globally which added to excessive risk taking globally (including in the US). I have already mentioned the cases of Iceland and the Baltic States. These examples are pretty clear examples of excessive easy monetary conditions leading to boom-bust. The graph below shows my decompostion of Latvian inflation based on a Quasi-Real Price Index for Latvia. It is very clear from the graph that Latvia demand inflation starts to pick up significantly around 2004, but headline inflation is to some extent contained by the fact that supply deflation becomes more and more clear. It is no coincidence that this happens around 2004 as that was the year Latvia joined the EU and opened its markets further to foreign competition and investments – the positive impact on the economy is visible in the form of supply deflation. However, due to Latvia’s fixed exchange rate policy the positive supply shock did not lead to a stronger currency, but rather to an increase in demand inflation. This undoubtedly was a clear reason for the extreme misallocation of capital and labour in the Latvian economy in 2005-8. The fact that headline inflation was kept down by a positive supply shock probably help “confuse” investors and policy makers alike and it was only when the positive supply shock started to ease off in 2006-7 that investors got alarmed. Hence, here a Selginian explanation for the boom-bust seems to be a lot more obvious than for the US. To me it is pretty clear that relative inflation will have to be at the centre of a monetary theory of bubbles. However, I don’t think that relative inflation alone can explain bubbles like the one we saw in the Latvia. A very important reason for this is the fact that it took so relatively long for investors to acknowledge that something wrong in the Latvian economy. Why did they not recognise it earlier? I think that moral hazard played a role. Investors full well understood that there was a serious problem with strongly rising demand inflation and misallocation of capital and labour, but at the same time it was clear that Latvia seemed to be on the direct track to euro adoption within a relatively few years (yes, that was the clear expectation in 2005-6). As a result investors bet that if something would go wrong then Latvia would probably be bailed out by the EU and/or the Nordic governments and this is in fact what happened. Hence, investors with rational expectations rightly expected a bailout of Latvia if the worst-case scenario played out. Yes, yes we might as well get out our hammer and say that the best way to avoid bubbles is to target the NGDP level. So why is that? Well, as I argued above a key ingredient in the creation of bubbles was relative inflation – that demand inflation rose without headline inflation increasing. With NGDP level targeting the central bank will indirectly target a level for demand prices – what I have called a Quasi-Real Price Index (QRPI). This clearly would reduce the risk of misallocation due to confusion of demand and supply shocks. It is often argued that central banks should in some way target asset prices to avoid bubbles. The major problem with this is that it assumes that the central bank can spot bubbles that market participants fail to spot. This is further ironic as it is exactly the central banks’ overly loose monetary policy which is likely at the core of the formation of bubbles. Further, if the central bank targets the NGDP level then the potential negative impact on money velocity of potential bubbles bursting will be counteracted by an increase in the money supply and hence any negative macroeconomic impact of the bubble bursting will be limited. Hence, it makes much more sense for central banks to significantly reduce the risk of bubbles by targeting the NGDP level than to trying to prick the bubbles.NGDP targeting reduces the risk of bubbles and also reduces the destabilising impact when the bubbles bursts. Finally it goes without saying that moral hazard should be avoided, but here the solutions seems to be much harder to find and most likely involve fundamental institutional (some would argue constitutional) reforms. As I stated above the bubbles are in reality rather rare and there is therefore in general no reason to worry too much about bubbles. That I think particularly is the case at the moment where overly tight monetary policy rather overly loose monetary policy. Furthermore, contrary to what some have argued the introduction – which effective in the present situation would equate monetary easing in for example the US or the euro zone – does not increase the risk of bubbles, but rather it reduces the risk of future bubbles significantly. That said, there is no doubt that the kind of bailouts that we have see of certain European governments and banks have increased the risk of moral hazard and that is certainly problematic. But again if monetary policy had follow a NGDP rule in the US and Europe the crisis would have been significantly smaller in the first place and bailouts would therefore not have been “necessary”.